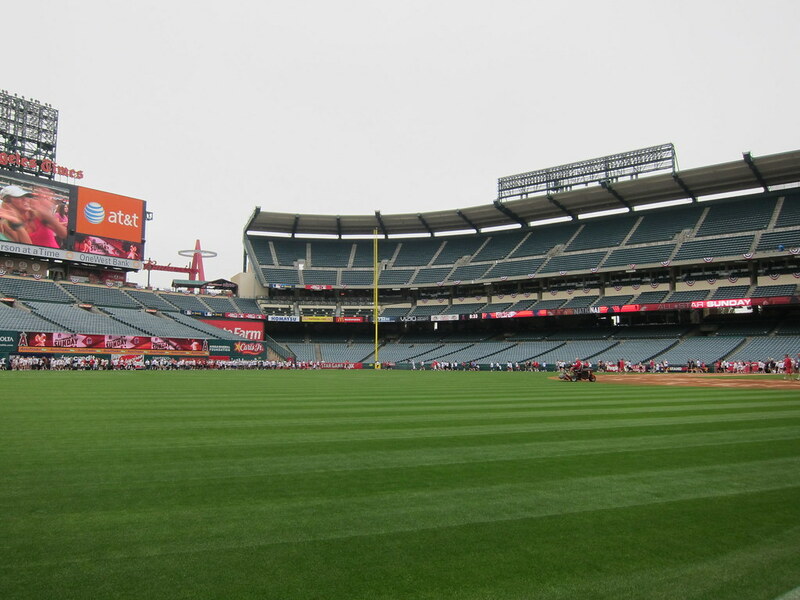 The Green Girl did the All-Star Charity 5k at Angel Stadium. 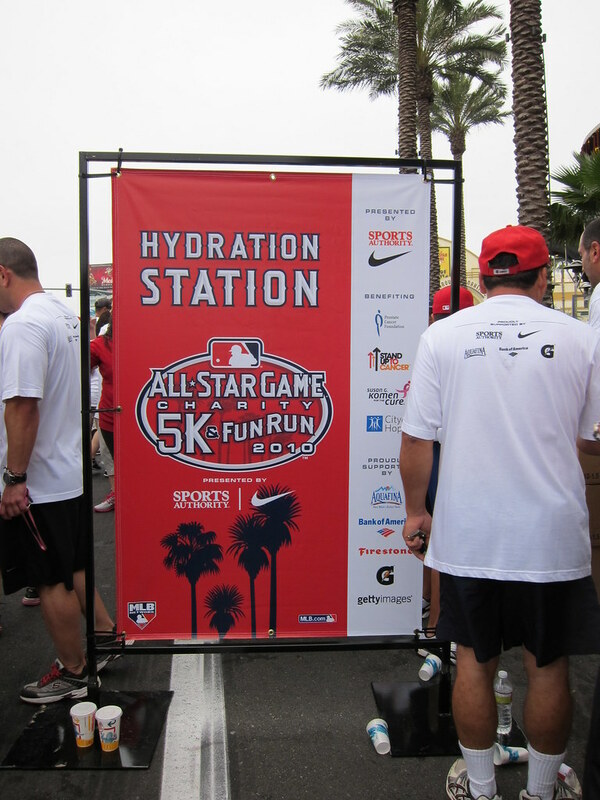 Along with the Major League Baseball All-Star FanFest, the All-Star Charity 5k is celebrating the Major League Baseball All-Star Game. One great thing about this event was that 100% of the registration fees are going to cancer charities. The All-Star Charity 5k was my first event representing Team Jamba Juice. I had on my Jamba Juice branded apparel and I applied a Jamba Juice tattoo to my left leg. 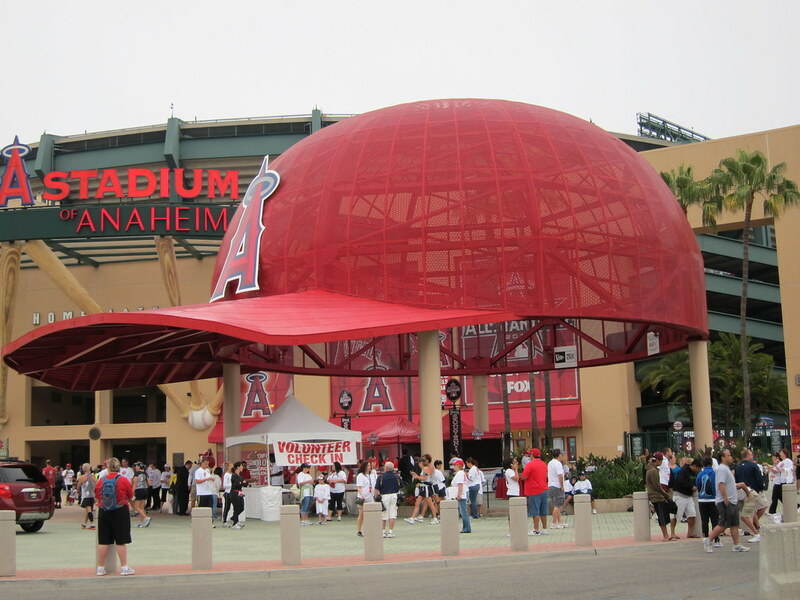 I met up with my coworker, Brandy, her husband, Oscar, and another one of the Sole Runners, Isabelle, under the giant Anaheim Angels baseball cap. We made the obligatory porta potty stop and then lined up at the Starting Line. 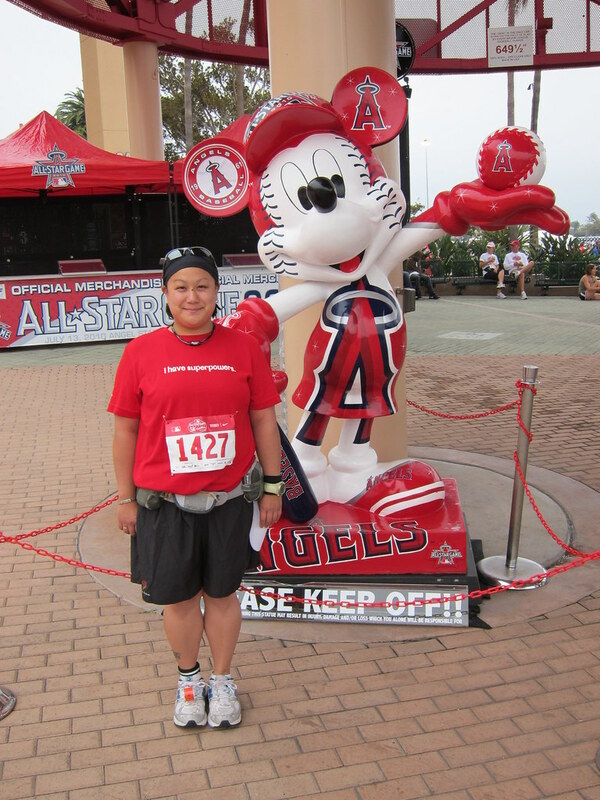 The majority of the runners were decked out in the Anaheim Angel's red so I blended right in with my Team Jamba shirt. In the first mile, I ran into another member of Team Jamba. We chatted briefly and then I took off to catch up with my friends. The course was conspicuous and the hydration stations were well-marked. The crowd support was literally non-existent but the energy among the runners and walkers was palpable. Shortly after we passed the Mile 2 marker, the course led us into the stadium, and around the perimeter. Although it created a significant bottleneck, I really enjoyed the experience and didn't mind the fact that the clock was ticking as I strolled the baseball field. Participants were featured on the JumboTron and you had the option to give an announcer your name to hear it read over the loudspeakers. I was absolutely thrilled when we finally crossed the Finish Line and I received my very first 5k medal. I grabbed the green Jamba Juice bag containing the stacks of Jamba Juice coupons from my car and headed back to the post-race area. As soon as I started asking people if they would like some $1 off Jamba Juice coupons, others would overhear and come over and ask for a few. The response was overwhelmingly positive. It made me feel really good to see the pleased expressions on people's faces when I handed them the coupons. Handing out coupons went so well that I gave away almost the entire batch within minutes. 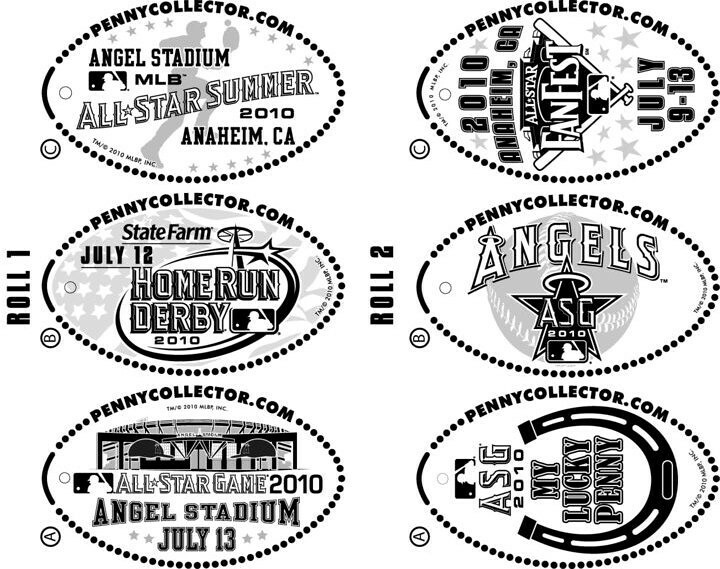 After the race, I headed over to the All-Stars FanFest to help out at the PennyCollector.com booth with the smushed pennies. I also handed out more Jamba Juice coupons. I'm thrilled that my first race representing Team Jamba Juice went so well. I had a really good time and it was great to see how receptive everyone was to the $1 off coupons. Good for you and Jamba Juice! Looks like you had a lot of fun. I heard there were quite a few runners at this event. At least they got Mickey out of the Giants uniform he was wearing on display at Fashion Island. And snap! I missed the Jamba Juice coupon give away? Thank you, Miss Zippy and Johann. Glenn, I really enjoyed the event. The energy was great. I'm out of coupons now but when I get more, I'll be happy to send a few your way! Sounds like a great time. Isn't it awesome to heard your name being annouced over the loud speaker as you cross the finish line! Everyone loves some Jamba Juice. This is so cooL! I love how you matched everything!!! So appropriate and you were not even trying :) High five on your first ever 5k MEDAL! Go team Green Girl! That is awesome that your race and the Jamba stuff went so well! You sound really excited in your post, and I love that! Everyone loves Jamba, so of course everyone wants coupons! Good job! Congrats on your run. It sounds like a lot of fun. I would have loved to have run it, but I was out of town. Maybe I'll run into you at a race...you'll recognize me by my Team Jamba shirt! btw, where did you get the Jamba tote? I have had to just carry my coupons in my belt pouch because my car was too far away from the race. Lisa, do you know what other races you'll be doing? My next event is the San Francisco Half Marathon - I'll be doing the first half. Great recap! I wish I had known you were going to be there, I would have looked for you and Team Jamba (and picked up some coupons ;) )! COngratulations on your first 5K medal!! Woohoo!!! What a fun sounding event! Must be neat to be part of a team like that. Congrats!!! !